Highgate Clinic, London's leading cosmetic surgery centre, recently gave its specialist consulting rooms their own facelift! Our natural white stone cladding panels provide a soothing and reassuring environment that further enhances the sense of efficiency and wellbeing this world renowned clinic is known for. This is an example of our stacked stone cladding panels being using as vertical rather than the more common horizontal cladding - and no, you can't see the joins! Mr Tom Davis of B J Davis Ltd, whose company specialises in internal refurbishments, says the "The Norstone rock panel, can be installed quickly and efficiently, which means the client will not be faced with any project delays". The Norstone cladding is being installed in many projects throughout the UK, including aged care homes, casino's, restaurants, hotels and offices. 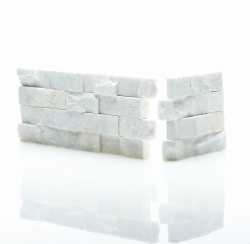 Stone Cladding creates the solid looking permanent feel to any reception or feature wall. The natural colours of the Norstone rock panel range, can suit any interior designers/architects desired look. White stone cladding as seen in these pictures highlight the beauties of natural stone, surrounding the consulting rooms of this private hospital. At Norstone we are proud to supply our natural stone cladding panel to any project whether it be large or small or indoors or outdoors. Talk to one of our distributors today. Norstone, will brighten up your home or office tomorrow.